This visual masterpiece, updated and up-ressed for a truly HD experience, including several HD filtering options. Trophy support provides players with brand new achievements to unlock as well as prestigious Platinum trophies for achievement junkies! 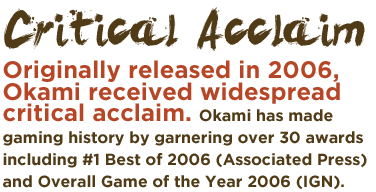 Originally released 2006, Okami recieved widespread critical acclaim. Okami has made gaming history by garnering over 30 awards in Pan-Western territories including #1 Best of 2006 (Associated Press) and Overall GOTY 2006 (IGN). ©CAPCOM CO., LTD. 2006, 2017 ALL RIGHTS RESERVED. Nintendo Switch is a trademark of Nintendo. ©2017 Nintendo. PlayStation family logo mark"PlayStation" andPlayStation 4 logoare registered trademarks or trademarks of Sony Interactive Entertainment Inc.
©Valve Corporation. Steam and the Steam logo are trademarks and/or registered trademarks of Valve Corporation in the U.S. and/or other countries.